In drift and circuit running or drag racing, intense G of both vertical and horizontal direction causing clumsy oil circulation that will lead engine to blow. We developed oversize oil pan for SR20 and installed to our N2 racing silvia to prove its highest performance. SR20 oversize oil pan allows gaining 600cc of its capacity without changing its distance to the ground. At the same time, partition and swinging plate inside secures certain oil circulation to every part of the engine even under the condition of cornering G.
Two partition s and swinging plate works to prevent leaning engineoil and secures stable oil pressure. The SR20 engine's oil block tends to fail due to the weak oil filter sensor screw which oftens breaks. We at TOMEI had found the problem while we were competing in professional N2 race series over 10 years ago. So we designed this upgraded product which solved the problem. THis was later discountined but due to it's extremely popular demand we decided to re-release this product with a new design. Now lighter than ever before and has the ports for the original OEM sensors for direct fitting as well. The failure of your oil block can lead to disasterous results with terminal engine failure. With all the time and money spent on your race engine this is an absolute must have upgrade to protect your investment. Especially with engines running a sandwhich plate or similar oil cooler this is an essential safety precaution. One product that serves various purposes, oil baffle and oil cut! The most ideal product for oil management today. Keeping track of proper oil function inside an engine assembly is vital, especially during high performance driving. This product in essence serves the same purpose as the standard 4G63 baffle except that it has been redesigned for increased efficiency, preventing catastrophic problems such as oil pressure drop. It also serves as a oil cutter which eliminates friction loss and is recommended for anyone who wants to take their 4G63 to the next level. 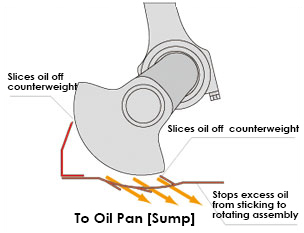 unnecessary amount of oil scooped from the crank. 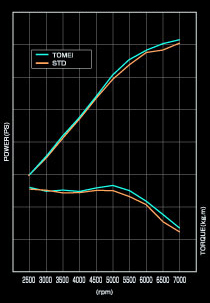 ■ Increased power output at higher RPM band. * This will fit on OEM 2.0L, Tomei 2.2L & Tomei 2.3L Stroker Kits. One of the common weak points of both the 4G63 & the 4B11 is the rise of oil temperature. It is seen more often during hard driving at closed tracks and other events. The EVO uses a thermo switch that will activate when the temperature gets around 85℃. Yet when the oil temperature is low, it won't activate thus restricting oil flow to the oil cooler which then consequently raises the oil temperature to unwanted levels. 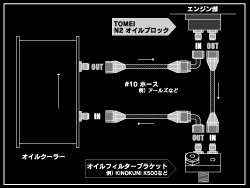 Our TOMEI oil thermo killer allows oil to flow into the oil cooler constantly regardless of the oils temperature. It is still easy to revert back to the stock thermo switch during winter periods to prevent over cooling as well.